The Southern Tang was one of China’s minor dynasties and one of the great states in China in the tenth century. Although often regarded as one of several states preceding the much better known Song dynasty (960-1279), the Southern Tang dynasty was in fact the key state in this period, preserving cultural values and artefacts from the former great Tang dynasty (618-907) which were to form the basis of Song rule, and thereby presenting the Song with a direct link to the Tang and it traditions. Drawing mainly on primary Chinese sources, this is the first book in English to provide a comprehensive overview of the Southern Tang, and full coverage of military, cultural and political history in the period. 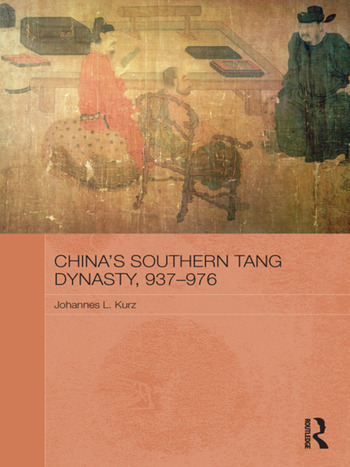 It focuses on a successful, albeit short-lived, attempt to set up an independent regional state in the modern provinces of Jiangxi and Jiangsu, and establishes the Southern Tang dynasty in its own right. It follows the rise of the Southern Tang state to become the predominant claimant of the Tang heritage and the expansionist policies of the second ruler culminating in the occupation and annexation of the two of the Southern Tang’s neighbours, Min (Fujian) and Chu (Hunan). Finally the narrative describes the decline of the dynasty under its last ruler, the famous poet Li Yu, and its ultimate surrender to the Song dynasty. Johannes L. Kurz is Senior Lecturer in the History Department at Universiti Brunei Darussalam. He is the author of Das Kompilationsprojekt Song Taizongs (reg. 976-996) (2003).